Crickets are celebrated in human folklore, feared by the superstitious, and extolled by literary giants including Shakespeare and Dickens. Worldwide, around 900 species of crickets exist. Of these, 100 species of crickets call the U.S. home. California's native and non-native cricket species include the field cricket, scaly cricket, and snowy tree cricket. If crickets drive you crazy, enjoy these fun cricket facts before the pest control technicians arrive. Crickets get their name for the sounds they make. Onomatopoeia is the term for creating a word that mimics the sounds made by the thing the word describes. Words like hiss, meow, and moo are examples of onomatopoeia. The word cricket has its origins in the Old French word criquet. The game cricket did not borrow its name from the chirpy arthropod known as the cricket. The sport of cricket owes its name to another Old French term, except the original word, in this case, means goal post. In Asian cultures including areas of China and Japan, crickets are so beloved that families have kept the tiny serenading creatures in ornate little cages for generations. At the Insect Hearing Festival in Japan, crickets are set free in a ceremony at the end of every summer. Some people love to fall asleep to the melodic song of crickets. Other people use crickets as sustainable little security alarms. The crickets grow quiet when anyone approaches their little cages, so they're true champions at giving an early heads-up when someone strange is on the doorstep. In ancient areas of the U.K. and Europe, numerous myths and superstitions about crickets exist to this day. In some cultures, crickets are harbingers of prosperity and good fortune. According to some Irish belief systems, crickets are Old Folks who've lived many generations and have epic tales to tell with their endless songs. Native American and other cultures believed that killing a cricket was bad luck. Meanwhile, Dickens gushed over the value of a cricket on the fireplace hearth. While munching on a cricket might seem strange, crickets are a delicacy in quite a few locations around the world. In fact, at least two billion people include crickets in their diets. Recently, Western scientists and food experts have experimented with the benefits of edible crickets for the U.S. dinner plate. They have strong reason to believe that crickets could enhance human gut health. Recently, one small study found that a diet rich in protein-packed insects increases healthy stomach bacteria and reduces body inflammation. As unpleasant as a deep-fried cricket may sound, crickets are a very sustainable source of proteins, minerals, vitamins, and healthy fats. Humans are good at digesting insects, so crickets are a possible food option to feed people of diverse ages. The little arthropods are a crunchy way to add nutrition to the diets of people with difficulty digesting other types of proteins. If you want a cricket to be quiet so you can get some sleep, turn down the heat. That's because a cricket will chirp faster as the air temperature warms. Crickets make their chirping sounds by rubbing their wings together. The male cricket woos nearby female crickets and scares off rivals by chirping. Chirps come from rubbing the ridges on one wing over the hardened areas of the opposite wing. Crickets do not make chirps by rubbing their legs together. The forelegs of crickets have special auditory organs to hear the chirps of other crickets more clearly. Apollo himself may have adored the cricket, but you may be one of those people who is aggravated by the constant nocturnal chirping. You may have camel crickets or another cricket taking over your laundry room or pool area. Seal up cracks around windows, vents, and doors. Eliminate interior and exterior leaks and wet spots. Keep firewood away from home and pool areas. Keep your trash bins and containers up on bricks. Use only sodium-vapor lighting around yard and pool. Call a qualified pest control professional if a cricket infestation has gotten out of hand. 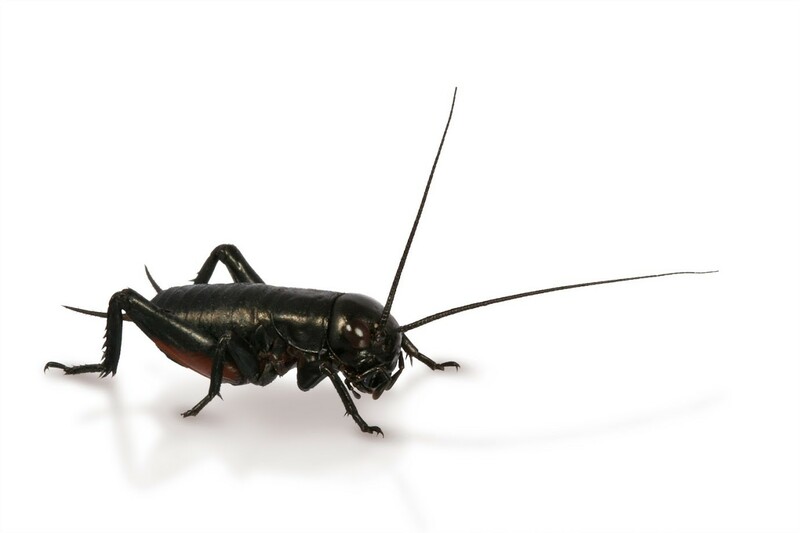 Pest control companies have a variety of tactics to bait, trap, and eliminate all types of crickets and other household pests. A pest control team will help you determine where the crickets have entered your home. After you close up access points and schedule routine pest control monitoring, your cricket problems should go away. If you need help with a cricket infestation in your Los Angeles home, contact Greenleaf Organic Pest Management today. We practice integrated pest management and offer you a choice of home and garden treatment options. Winter time brings lots of special pest challenges based on the changing tempetures and the pest that increase activity. Rodents, ants and other common pest will look for easy access to your home. As an organic pest control company, I get asked a lot how to reduce pest around the home without pesticide? I’ve shared many tips in the past and have posted a homeowner guide on our website, but I would like to go into a couple areas that are typically overlooked. We all love our gardens and landscape designs around our homes, but have you thought about how location, water, growth, fruit, and weed control barriers affect your pest control? Sure you could “plant” cement all around your home and that would certainly reduce pest activity. But who wants a concrete jungle around their home anyways. So how can we have the best of both worlds without compromising our safety and risk damage to our home? Knowing a little about pests can sure help when you are planning landscape design. Access is a key element, especially rodents finding their way in to your home. Trees can be one of the biggest points of access, especially when the trees are close to the home. Rats can jump 4 feet vertically to a roofs edge and can drop many times that without being hurt, so keeping trees trimmed back and away from structures will certainly help with rats, squirrels, ants and other pest from having an easy access. If you are thinking about planting any large trees around the house, remember to think down the road once these trees become established. The damage that a poorly placed tree can be not only a pest haven, but can cause catastrophic damage to roofs through adverse weather, pest (beetles) infestations that weaken the limbs and lift walkways, foundations and bust sewer lines, which all can be access and harborage points for all kinds of critters. Keeping gutters clean will also help reduce “aerial nest” of pest. Keep shrubs and bushes at least 2 feet from any wood windows, and siding. Plants need water and water doesn’t mix well with wood. Automatic sprinkler systems are great but need constant monitoring. Many watering plans water more non-growth areas than green and this is not just a waste of money and water, but it creates additional problems. Water constantly hitting stucco walls creates a warm, wet interior wall that can promote mold and pest harborage for many insects such as termites and carpenter ants. Overwatering and off site application also creates puddles which promotes many unnecessary problems. This time of the year you should be reducing the frequency of your programmed sprinkler system. Most homeowners don’t make the changes and this keeps the grounds saturated, so when rains come the property floods and pest “move” to a more suitable site, such as your pantry or bathrooms. How many times have you seen sprinklers going off in the rain or on days that known rain is in the forecast? It’s a great idea to walk around your home monthly to look for and identify conditions that would be conducive to harborage and access. You would want to check screens and door weather stripping for possible repair or replacement. Remember, pests are opportunist and will find their way in your home through many access points. If you have a concern, don’t hesitate to contact us.